I live in toronto canada, and there are a few womyns riding groups, but seem too cliqueish! i ride with durham riders and love it. But need more female riders, not having their husbands or b.f tagging along..committed and have free time on weekends or night time. now its winter... but to put this in your minds. Im a new M2 rider, though ive ridden over 5,000 Kilos.. to Wawa and back alone. about 1,000on its own) kingston ont, etc. I wish i coud go to the USA right now and hang with some women, califorina, or the desert!!! and ride til my spring is here!!! but im a bit broke... lol. i just need to get away!!! so if anyone lives in toronto and not in a group with rules and asking for money! msg me. can i give my email? def next yr. I rode there last summer, my first time on a bike. went to kingston, napanee and then toured arond!!! if u r serious, and want to ride next yr, im in scar but we can always meet half way, i will ride with u.
im still riding.. when not high winds and raining. I'm living in Kingston and own a Harley Sportster and looking for mind liking female riders to do trips with. Any takers? I recently saw you post, am also looking to join a riding a female riding group in the area. I haven't gone anywhere near the kms you ladies have: I started riding last August and probably have gone a total of 30km since, just driving around the city and practicing stopping/turning etc. I would LOVE to get together with a group (specifically a female group) to better my riding skills and confidence on the road. I ride a 1992 Honda CB250, so it's not super fast but it's a great starter bike. Please email me at jillianrebeccamoores@gmail.com to get in touch. Anyone want to ride yet? if serious, email me back, and or call me? so far no one's called me or emailed me for rides. ive ridden 4 times so far.. since ive gotten my bike back. and will be going tomorrow, sunday april 21st and monday. Mississauaga, with a few from a group i belong to. I gues solo, really means solo! haha. HI THERE I SENT YOU AN EMAIL. DID U GET IT. 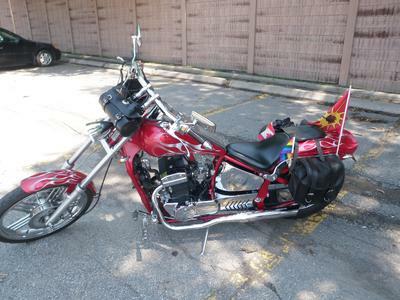 theres a ride in about 2 weeks in the east end..
then to bike show at the CNE. I prob wont go to the CNE, too much money to get in. ok sorry i didnt see this msg til a few days ago. Join in and write your own page! It's easy to do. How? Simply click here to return to Need a club or riding group?.